This is a plant that can be grown in a container, or used in a rock garden and Sedum adolphii looks great in both. It is a bit of a scrambling plant, the stems reach out over time and it will form a clump. A golden green clump with attractive waxy foliage and small white flowers in spring. Best grown in a free draining sandy soil in a position where it gets good sun for most of the day. A little slow release fertiliser once a year is adequate in most soils. Use a specialist free draining cactus and succulent potting mix. Make sure the container has adequate drainage holes. Plant in a container twice the diameter of the plant itself. Plant at same depth it was in the old container. Do not water again until the soil begins to feel dry. Do not let the pot or container sit in a saucer of water. Keep the plant in bright light for best foliage colour. Keep away from frosts. Use a slow release fertiliser in spring. 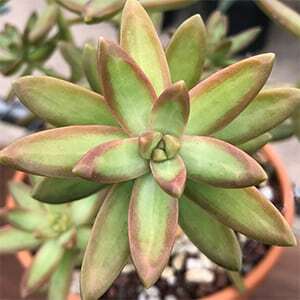 Common Name – Adolph’s Sedum, Golden Sedum. Light – Full sun to part shade, afternoon shade in summer. Foliage – Golden yellow with green. Flower – Small, pale cream to white in colour.